Ambronay Editions continue their support for younger musicians with a first recording by the organist, harpsichordist and musical director Louis-Noël Bestion de Camboulas. I have previously reviewed him (here) as the director of the group Ensemble Les Surprises. This programme contrasts music for harpsichord and organ, genres quite often interchangeable in the Renaissance and Baroque periods. Many manuscripts of the period include pieces suitable for one or other instruments, or both. The absence of an independent pedal does not always imply performance on a stringed keyboard instrument. 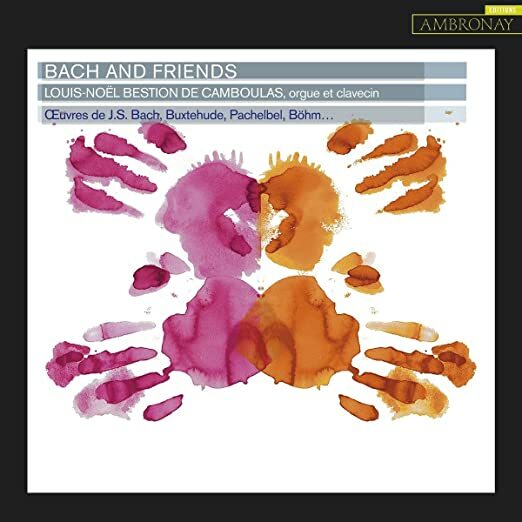 That said, the pieces on this recording are generally well suited to the chosen instrument, although the title of Bach and Friends is a little off-kilter. Few could be seriously considered as personal friends of Bach. But all influenced him in one way or another, even if, like Scheidemann, they died well before Bach was born. The recording opens with a sequence of five pieces played on the harpsichord, starting with a dramatic manualiter Praeludium by Buxtehude, in the stylus phantasticus. One of the many versions of Dowland’s Lachrimae, in this case by Scheidemann, is followed by an unusual Suite by Johann Caspar Ferdinand Fischer – unusual in that it has only two movements, a Prelude in the stylus phantasticus and a Chaconne in the French manner. Pachelbel’s Aria Sebaldina is in the remote key of F minor, although the temperament of the harpsichord does not cause any problems. The harpsichord used is a copy of an instrument with an interesting history. The original was made in 1722 by Johann Heinrich Gräbner in Dresden. Since 1787 it has been in the Villa Bertramka, Prague, where Mozart used it while composing Don Giovanni. It has an attractively rich and sonorous tone. The organ is the 3-manual instrument built by Dominique Thomas in 2014 for the church at Ciboure, France. It is based on historical examples from the Dutch tradition of the 17th century, a style that also influenced North German organ builders such as Arp Schnitger. The specification of the organ is given, but not the registrations of individual pieces. Georg Muffat was one of a number of composers who sought to combine the styles of different countries, in his case France and Italy and the Italian-influenced area of southern Germany, as demonstrated by his Toccata Nona. Three settings by Georg Böhm of the Lutheran choral Vater unser im Himmelreich follow, including the beautiful chorale orné version, here using the simplest of solo registers. The recording ends with Bach famed Fantasia and Fugue in G Minor (BWV 542), two pieces that do not seem to have been intended to have been paired together, but have become well-known as a pair. Louis-Noël Bestion de Camboulas’s playing on both organ and harpsichord is excellent. He has a fine sense of touch, articulation, and the projection of a musical line.